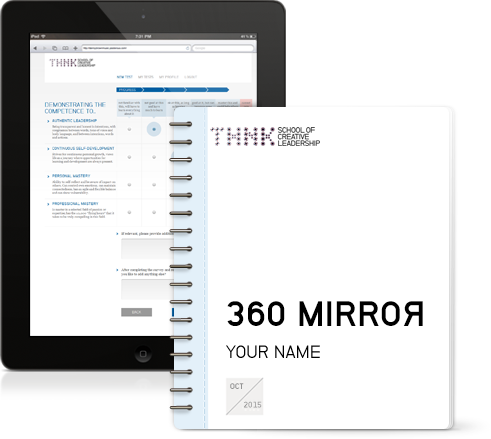 360 Mirror is a comprehensive 360° leadership development tool. It is developed by THNK to provide insights into your creative leadership skills. In only a few steps you’ll learn about your strengths and learning edges, resulting in the ultimate chance to enhance your unique set of gifts. think big and bold when it comes to your mission. articulate clearly the triple bottom line impact of your mission. surround yourself with team members who are more gifted than yourself. channel conflict in a team to unlock new, creative solutions. formulate a robust business model to underpin your mission. use ambiguity in realizing your vision instead of seeing it as a blocker. articulate today what your legacy to the world will be. articulate how your legacy will build on your personal values, passions and strengths. Complete this yourself by answering a series of questions that will help you reflect on your leadership skills. Ask at least 6 people to provide anonymous feedback on your leadership skills, adding depth to your self assessment. When completed, you can download or print the results. This will help you to gain insights into your inner leader.